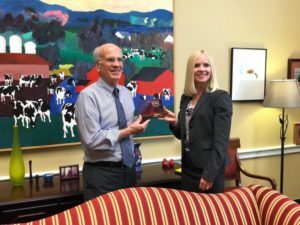 The American Wind Energy Association (AWEA) named Rep. Welch (D-Vt.) a U.S. Wind Champion for the 115th Congress at a September 6th event hosted by Avangrid Renewables, a leading renewable energy company with a portfolio that spans 22 states. AWEA’s U.S. Wind Champion Awards recognize select members of the 115th Congress who have taken action in support of American wind energy. 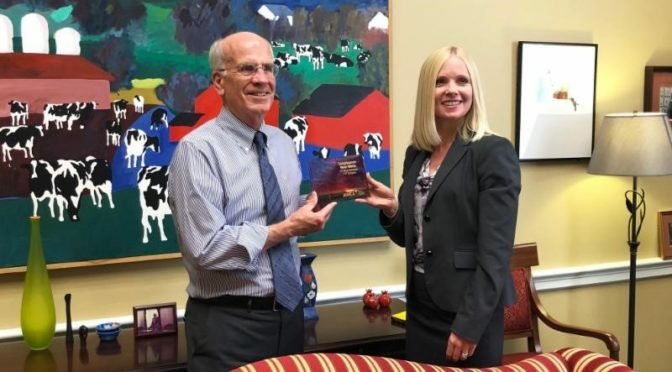 Laura Beane, President and CEO of Avangrid Renewables presents the Wind Champion Award to Rep. Welch (D-VT). Vermont ranks 13th in the nation for wind power as a share of yearly in-state electricity generation, with wind contributing over 13 percent last year. Wind power also makes a strong contribution to Vermont’s economy, supporting nearly 1,000 in-state jobs and representing more than $300 million in private investment. Wind energy is a drought-proof cash crop for Vermont farmers and rural landowners receiving $100k-$500k a year in total land lease payments. For Vermont, increasing reliance on wind energy saves water and prevents over 19,000 tons of carbon pollution each year—the equivalent of taking 4,000 cars off the road. The U.S. is a global leader in wind energy production thanks to world-class natural resources and technological innovation. For Americans, wind power leadership translates to economic opportunity, homegrown energy and clean air. A record 105,000 Americans across all 50 states work in wind power, affordably and reliably supplying over 6 percent of U.S. electricity while creating public health benefits worth more than $8 billion each year through avoided air pollution. AWEA is the national trade association of the U.S. wind energy industry. We represent 1,000 member companies and over 100,000 jobs in the U.S. economy, serving as a powerful voice for how wind works for America. 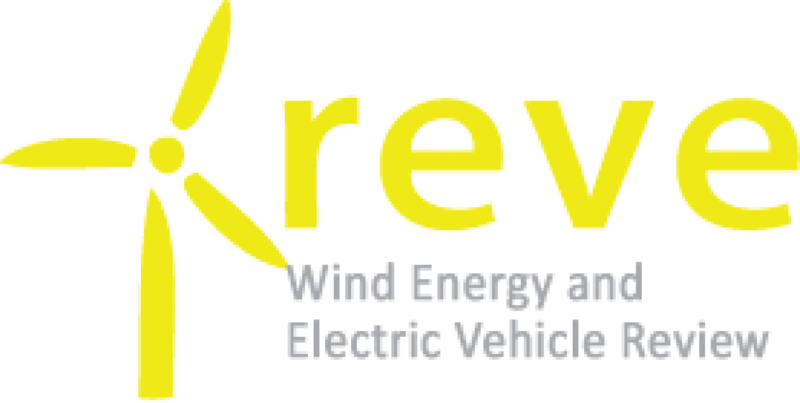 Members include global leaders in wind power and energy development, turbine manufacturing, and component and service suppliers. They gather each year at the Western Hemisphere’s largest wind power trade show, the AWEA WINDPOWER Conference & Exhibition, next in Chicago, Illinois, May 7-10, 2018. Find information about wind energy on the AWEA website.